The celebrations commenced with a festive Divine Liturgy at St. Andrew Ukrainian Catholic Church in Parma, OH, for it was in this church that the newly ordained priest, Father Michael Rewtiuk, celebrated his first Divine Liturgy on February 2, 1969, feast of the Encounter of Our Lord with Righteous Simeon, shortly after his ordination to the priesthood in Philadelphia, PA on January 30, 1969, feast of the Three Holy Hierarchs (both feasts according to the Gregorian calendar). The Eucharistic celebration was presided by Most Reverend Bohdan J. Danylo, Bishop of the Eparchy of St. Josaphat in Parma, who also delivered a homily, with Monsignor Rewtiuk as the main celebrant. The Liturgy was concelebrated by many priests and a deacon from St. Josaphat Eparchy, Byzantine Catholic Eparchy of Parma, and the Roman Catholic Diocese of Youngstown and attended by many faithful and religious. During the homily, Bishop Bohdan, having begun with a meditation on the Sunday Gospel (Sunday of Zacchaeus, according to the new calendar) gradually transitioned to talk about the priestly life of Msgr. Rewtiuk. Having mentioned the jubilarian’s major accomplishments as a presbyter, for which the bishop thanked Msgr. Rewtiuk, Bishop Bohdan accentuated some of the most important aspects of the priesthood by citing a couple of prayers from the Rite of Ordination of a Priest – the prayers that sum up the essence of the priesthood. At the end of the Liturgy, Msgr. Rewtiuk was read and presented with the congratulatory letters both from the Father and the Head of the Ukrainian Catholic Church, His Beatitude Sviatoslav Shevchuk as well as from Bishop Bohdan Danylo. The Liturgy concluded with the heartfelt singing of “Many and Happy Years” to the bishop, the jubilarian, the clergy, the faithful, and all the people of the good will. Festivities continued at St. Andrew Church’s banquet hall where the guests, besides the delicious food and drinks, were able to share in the festive speeches about the life of Msgr. Rewtiuk that were delivered by Bishop Bohdan Danylo, Very Rev. Canon Andriy Hanowsky, Pastor of Sts. Peter and Paul Ukrainian Catholic Church in Cleveland, OH, and Very Reverend Fr. Ihor Kasiyan, Pastor of St. Andrew Ukrainian Catholic Church in Parma, OH, which were presented both with ardor and amusement. The well-arranged artistic program and the photo collage on the life of the jubilarian only added to the jovial spirit of the occasion. The festivities in the hall were coordinated by the event’s master of ceremonies, Mr. Andriy Harmatiy, a parishioner of St. Andrew Church. At the conclusion of the celebrations, the floor was given to Msgr. Rewtiuk. 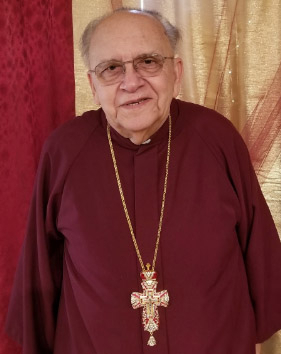 During the concluding remarks, the jubilarian reflected on the 50 years of his priestly life most of which he spent ministering in St. Josaphat Eparchy. While not everything was easy on his life path, Monsignor thanked the Lord for the gift of the Priesthood and all the graces that the Lord sent and continues to bestow on him as well as expressed his gratefulness for all the people that have been accompanying him throughout his entire life, particularly his now deceased mother as well as some other persons.